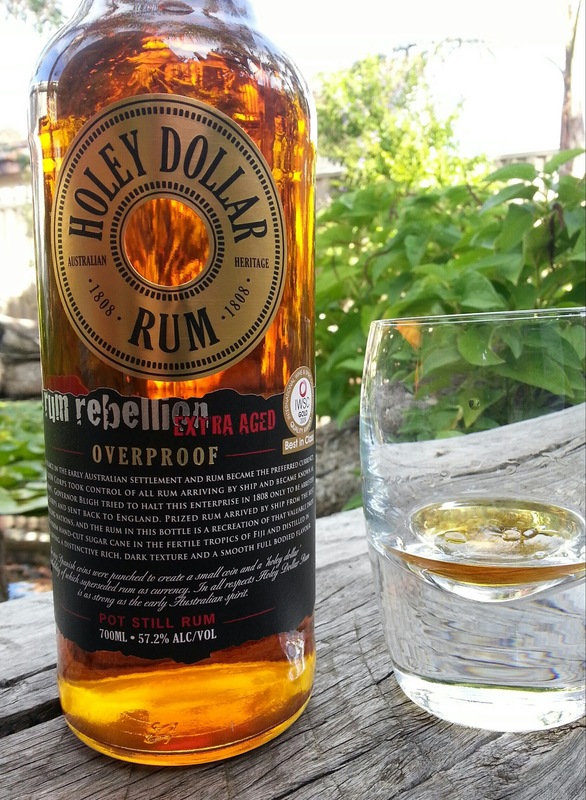 Holey Dollar Gold Coin is an “overproof” rum at 57.2% alcohol volume. A product of Fiji, this rum is ideal for sipping either with ice on a bright sunny day or neat on a cold night. This rum smacks the tongue with a burst of fire, like a canon ball. It then unleashes a lovely array of flavours loudly like swashbuckling buccaneers on a rowdy adventure! This rum offers the foundation of sweet raw sugar moderated with sharp spice, bitter oak and a deep earthiness. It is not overly sweet and instead boasts impeccable balance. This balance is something I have come to really appreciate in Holey Dollar products, because some rum can be dominated by sweetness and sugar. It is clear that great quality hand cut Fijian sugar cane is used to produce this “overproof” rum. What is “overproof” rum? Why was this gunpowder test used? Well, the simple answer is that people want PROOF before trusting strangers that a rum is not watered down…. especially pirates and burly Naval sailors from the 18th century ARRRR! Therefore, British sailors from the 18th century and beyond would test rum to make sure it was not diluted too much with water by pouring the rum on gunpowder and trying to set it on fire. If the gunpowder exploded – BOOM! – the sailor would know the rum was “overproof” (and good value!). If the gunpowder in the liquid did not ignite, the sailor would know that was rum was watered down too much and thus “underproof” because gunpowder does not burn in liquid below 57.15% alcohol. The parrots would screech and the swords would clash!… are ye tryin to fool me matey? So, rum over 57.15% alcohol volume is the most diluted a rum can be while allowing the combustion of gunpowder. I can only imagine the crafty sailors (and you know there were plenty!) who would painstakingly water down rum incrementally while testing it often until it reached proof… rum, fire and gunpowder on a wooden ship, what a safe combination! Rum was important for the British sailors, who from 1740 received half a pint of rum per day and double rations before and after battle! This must mean that Jack Sparrow’s slurred speech may actually be an accurate portrayal. Rum is no longer rationed to British sailors, just in case you were thinking of enlisting. The nose on this rum presents raw sugar, prune and raisins with the piercing sharpness of spicy wood. There is a bitterness that is quite uniquely Holey Dollar as the whiff of alcohol delivers a fiery burn, and all while the sweet banana and dried coconut add some more character. With ice the bitterness of oak and earth mellow while sugar cane and brown sugar strongly develop. Ripe figs and honeyed lemon cake also develop. An immediate wave of sweetness and bitterness wash up against the tongue, bringing that ferocious alcohol and helpings of prune and brown sugar. What I particularly enjoy about this rum is its impeccable balance and its vibrant spark of youthfulness. It is not overly sweet, as most rums are. It has a surge of bitterness and sourness that moderates the sweet theme of sugar, as oak and a strong earthiness (mahogany, maple, sap, earth) add substance and character. The flavours flood into the palate with the force of a Fijian national team rugby scrum, and then tickle the tongue gently. It is aged for three years so it has a lovely rawness and youthfulness that explode on the tongue like fireworks, and it is smooth and silky with lots of character. With ice the rum is obviously colder on the tongue, and the sharp rawness is a little dulled though the presence of bitter oak and sweet dried fruit like prune remains quite strong. This rum is superb with ice, but for that lovely kick I recommend drinking this rum neat. Though, the ice mellows the sharp flavours and this is ideal for a leisurely drink on a nice warm day! Long and strong, with force it floods the palate but then gently tingles on the tongue releasing ts beautiful flavours. This is another wining rum from Holey Dollar.